This year has been extremely busy for the team and to finish the year off, we decided to upgrade our server farm. Our new systems are much more powerful than the previous set up and this has given us a number of benefits. Firstly, Google and other search engines monitor the loading speeds of web sites using tools like PageSpeed. We all want web sites to load as fast as possible so that we do not waste time waiting and Google takes load times into consideration when ranking sites in their search engine. As with all SEO related things, loading times is just one factor that Google takes into consideration but it's an easy one to fix. You can test the loading time of your own web site using the PageSpeed tool - just type in your web site address and click 'Analyze'. If you get a warning about your site's load time, it may be time to switch to a different web host. Get in touch if you'd like us to see if we can help with your hosting and speed up your load times. With our new server farm, load speeds have significantly improved and we've seen with our SEO customers that their sites have benefitted from the upgrade. Another advantage of the upgrade is that we are now able to offer free SSL certificates. These have a number of benefits including, as above, they can help boost your site in the search engine rankings. We are continually improving our systems to make life easier for our customers and provide additional features. If you have any questions about your site or how we could help improve its rankings in the search engine results pages, please get in touch. We have recently completed a huge content update for TMS Motorsport's web site. 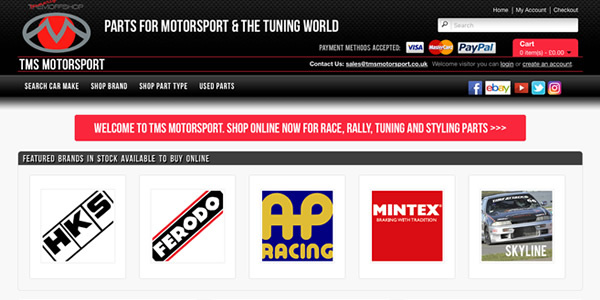 TMS Motorsport is an online seller of parts and accessories for race cars. Based in Wokingham, they sell parts across the UK to motorsport enthusiasts who are upgrading or tuning their car for road or track use. They have thousands of products in stock and wanted their site to be more user friendly, having engaging text on their site instead of the supplier-produced text which every other site has. As well as making the text more engaging, the new content needed to be SEO friendly - allowing their web site to climb the search engine rankings when people were searching Google for specific replacement parts. Over the course of a couple of months, we replaced much of the text on the site with new, search engine friendly wording that was more useful and engaging to their potential customers. As well as helping the site move up in the search engine results, the long-term plan was to reduce their spend on Google Adwords each month. Originally, most of the traffic coming into the site was through Google Adwords, which costs the business money each time someone clicks on one of their ads. As the site moves up the search engine results naturally, more people will find the site this way and so less money will need to be spent on Adwords, meaning a long term saving. 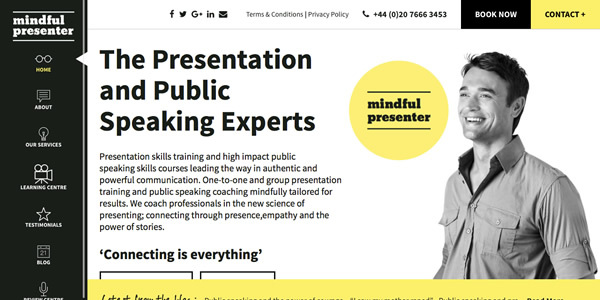 Mindful Presenter is web site to promote their presentation skills and public speaking workshop courses for professionals. The courses are run across the UK and around the world, helping people in senior positions to develop their presentation skills and to end the 'death by PowerPoint' culture that has developed in recent years. The workshops are designed to make the presentations more interesting, engaging and memorable. We were recently asked to add a new 'Style Quiz' to their web site. This allows people to complete a short online quiz, in a fun and simple format, so that they can get a better insight into the type of presenter that they are. The quiz takes around a minute to complete and then it gives you scores in each category and gives you a description of the type of presenter that you are. We developed the quiz and added it as a custom page to the existing WordPress site. The majority of our customers are on pay monthly web site plans, meaning that for a small fee each month we build, maintain, host, update, backup and generally look after their web site so that they can focus on their businesses instead of worrying about all of the boring technical stuff. As part of this, we always encourage our customers to review their sites every so often and think about any new features that they would like adding. Last week we implemented three updates which are useful but things that people rarely think of when they first have their sites built. Of course, because of the pay monthly plans, all of these updates were done for free. Della asked us if it would be possible to add a 'click to call' button to her web site so that anyone visiting the page could call her easily. Previously visitors had to copy the phone number down and then enter it into their phone. Now, they can just click on the button and their phone will automatically start calling Della's number. It's a small and simple addition to the site but it makes the user's experience much easier. Pete runs Platoon Stores, an online retailer selling various BB guns, knifes and hunting related equipment. 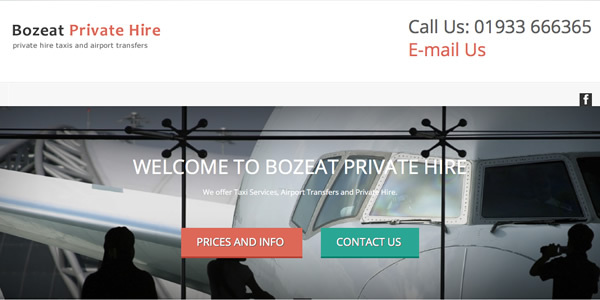 He asked us whether we could add functionality to his site so that he could offer discount vouchers and bundles deals to customers. The discount voucher system was already added to his site but we have now added 'bundle deal' functionality so that he can set up discount for his customers if they buy certain products e.g. if they buy three particular products, they receive a 15% discount on their order. This was slightly more complicated to set up but it is a great way to 'up sell' to customers - generating more income for the shop whilst also providing loyal customers with a way to save money. Kim runs a jewellery shop in Sandwich in Kent and an online shop. He wanted to add functionality to his shop so that he could offer a 10% discount on products in certain categories. This is a great way to offer customers a discount but limit it to certain products easily i.e. you do not need to update every product that you would like to offer a discount on, rather you can just apply the discount voucher to an entire category of products. This update has now been applied and Kim is busy e-mailing his mailing list of customers, letting them know about the special Christmas deal.